Indications: Treatment of asthma and other lung conditions. Summary Recommendations: Inhalers are prescribed for patients with current or chronic lung conditions. Inhalers can be used safely and effectively during pregnancy under the care of a physician. It is best not to use over the counter inhalers without physician approval during pregnancy. Asthma inhalers contain medications in liquid form that can be delivered directly to the lungs. While it may appear that all asthma inhalers look the same, the medications housed inside are quite different. Inhalers can contain corticosteroids, also known as glucocorticosteroids or topical corticosteroids. The steroids reduce inflammation in the lungs and breathing passages, essentially making it easier to breather. 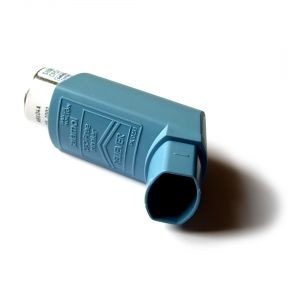 Corticosteroid asthma inhalers are used as both emergency and maintenance medication. Common corticosteroids include triamcinolone, flunisolide, budesonide, fluticasone, ciclesonide and beclomethasone. Bronchodilators also relieve inflammation, but without the inhaled steroid. The three types of bronchodilators are theophyllines, beta-agonists and anticholinergics. Drugs used in bronchodilators for rapid treatment of asthma include Albuterol, pirbuterol, levalbuterol and ipratropium – these drugs provide symptom relief not treatment. Long-acting bronchodilators like the beta-agonists formoterol and salmeterol work with other asthma medications to prevent attacks. There are also anti-inflammatory asthma inhalers that contain no steroids and cause fewer symptoms than other asthma inhalers. These include nedocromil and cromolyn. While they work well to reduce, and possible prevent, symptoms of asthma, they are not as effective as corticosteroids. General Precautions: Controlling asthma during pregnancy is extremely important to the health and well-being of the fetus. Reduced oxygen intake associated with impaired breathing, a symptom of asthma, can result in reduced oxygen delivery to the fetus. Pregnant women with asthma will typically use an emergency or daily use inhaler for the duration of pregnancy and beyond. Use of inhalers during pregnancy is suggested be obstetricians to improve pregnancy outcome and reduce risks of pregnancy complications. If you’ve just discovered you are pregnant, continue using asthma medications as prescribed. Contact your obstetrician for the first prenatal appointment. You can also choose to contact the doctor who prescribed the asthma medications for more information on asthma, pregnancy and breastfeeding. Effect While Trying to Conceive: There is no known connection between infertility and inhaler use in either men or women. Effects on Pregnancy: Inhalers are generally considered safe for use during pregnancy. Multiple studies have confirmed improved pregnancy outcomes associated with inhaler use. Asthma, the most common condition for which inhalers are prescribed, can reduce oxygenation of the blood when left untreated. If the blood does not carry enough oxygen to the fetus, birth defects and fatality can occur. Other possible side effects of untreated asthma during pregnancy include increased risk of preeclampsia and high blood pressure. Premature delivery, low for gestational age birth weight and small for gestational age infants have been born to pregnant women with uncontrolled asthma. In some cases, inhalers are prescribed during pregnancy for the treatment of bronchitis and other lung impairing illnesses. Safe During Breastfeeding: Inhalers prescribed for asthma and other lung conditions are safe for use during breastfeeding. There are no reported adverse side effects associated with using an inhaler at this time. It is extremely important to continue using all asthma medications to control symptoms as directed by your physician.